Bienvenida a Somos All American y Yo Soy All American! Finally, there is a Movement for All Americans! One focused on solutions, not political rhetoric. There are better ways, ways true to The All American Ideal, and ways that can bring The All American Dream to everyone. 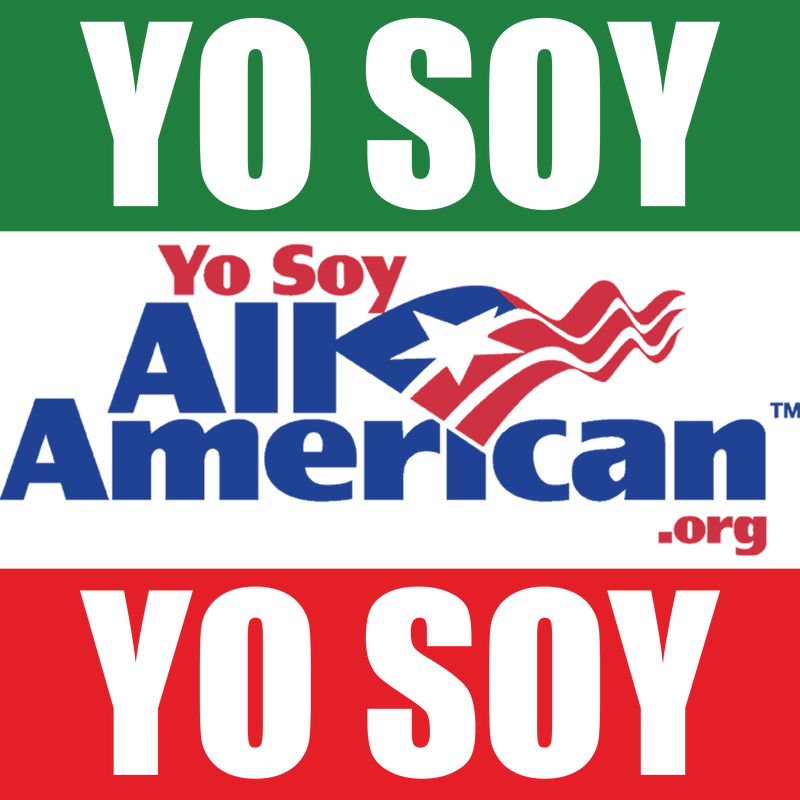 Too much of today's political posturing blames, and insults, people of Hispanic and other origins. We think this is rude, racist, economically flawed and totally unnecessary. With your help, we hope to change this. 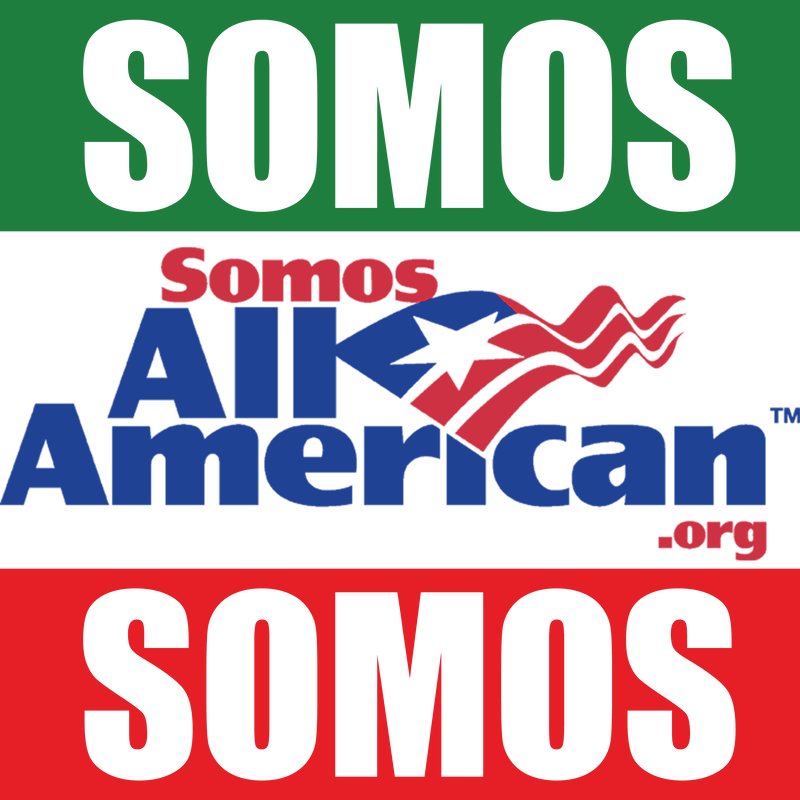 WeAreAllAmerican.org, along with our sister websites SomosAllAmerican.org and YoSoyAllAmerican.org are honored to welcome you, your families, and your multi-century contribution to our great nation. All American gear says you care, that you believe in our nation, our people, and the All American Dream! It says you are ALL AMERICAN through and through. Help start a deeper conversation by making a statement. Click the image to the right to create your own All American gear for you or a friend. Show others that you believe in All Americans, no matter their race, religion, or country of origin. Use our logo-wear as a way to say you are proud to be an American, and as the introduction to a new dialog, and possible new friendship. A Wall Is Not The Answer! It is easy - no, mentally lazy - to blame others for our socio-economic issues. Such thinking comes from a scarcity driven mindset. America's issues are not the fault of people who work hard and productively. Our problems are, as we will show you in the months to come, rather the fault of poor policy, and backward thinking. Walls and tariffs will not make American business more competitive internationally. They will not create jobs or prosperity. Nor, is it good business, economically healthy, or tasteful to alienate 19 out of every 20 potential customers around the globe. No, other factors such as tax policy, poor educational results, crony capitalism, and government bureaucracies are causing All American goods and services to cost 20-30% more than they should. These, and other things, are keeping large percentages of our people trapped in poverty. If we address these issues, we can create, what we call, The All American Super Economy. We would not be closing our borders if our economy was booming like it could. We would instead, be opening our doors wider and inviting millions more to come to America to help build an ever more prosperous nation, and world. We believe in abundance. We believe hard work and smarter solutions can bring greater wealth and personal freedom to everyone. Stay tuned to learn more about our ideas. In the months ahead we will be offering a series of better ways to bring jobs and higher incomes to All Americans. Sign in to stay connected, and to have your say. When it comes to immigration, most of today's rhetoric and resentment seems focused on America's southern, not northern, border. This selective position reveals an unprincipled position, particularly when homeland security experts say terrorists are more likely to enter from Canada. This is why many feel the current push is racist. Sadly, Hispanics are far too often the scapegoat, or brunt of this vitriol. It is not fair, but it is reality. As such, the position statement below, is toned more so on this part of the immigration conversation. That does not mean that our position is different for people from other parts of the world. We believe the position, to be principled, must be consistent. There should be no question that all Hispanic American citizens are endowed with the same God given rights of all men, and that all of the rights outlined in the United States Constitution belong to these Americans as well. And, while it may be presumptuous to assume the issue of immigration concerns you; if you are such an American, we assume it affects enough people in your life, to make clarifying our views important to those of you considering joining our Movement. What is often in question, though seemingly more so for Hispanics than other immigrants, are the rights of immigrants (legal and "illegal"). We believe the conversation has largely taken a counterproductive, mean-spirited (if not racist), over-politicized, and illogical turn. As such, we would like to explain our stance. You may or may not agree with it, but we do believe it does re-frame the discussion on what we believe are a set of more important criteria to drive future public policy. We hope you agree, and would love to hear your opinions and alternative ideas. If you already are, or want to be, a hard working American citizen, willing to defend our nation against all others, including in the always undesirable event of war, your family's country of origin, we say welcome! The All American Super Economy needs productive, hard working individuals and good families from all over the world! We always have, and always will! It is one of the strongest strands in the All American DNA. We benefit in new and unique ways of seeing and doing things. Every culture brings fresh ideas. It is a blessing. It may not always seem like it, but greater productivity and wealth creation helps everyone in the end. It gives America the opportunity to incorporate the world's best and brightest solutions. This is nothing, but an advantage. We believe the conversation should be focused on something other than race, and/or country of origin. To us, the question is simply, to what country do you pledge your allegiance? If you are fully vested in America, All Americans should be happy to invest in you. By contrast, if you merely want to work in our country, and are unwilling to defend our nation, we suggest that is a different situation. If you are not vested in America, it is not fair, or ethical, to take advantage of the hard work, resources and safety provided by the American people. It should be okay for you to work here, but then the bulk of that expense should fall upon you and your employer. If your contribution to their business is such that they are willing to pay you enough to educate and fully care for you and your family, fantastic. We are happy to welcome you on a worker visa. We believe there is a meaningful difference between someone who is fully vested, and someone who simply wants to benefit from our economy, healthcare and educational system. If you are such an individual, it is understandable, but it is not right. Different rules should apply. If you consider yourself, and want to remain, a citizen of another country, we wonder if you should instead be working to bring what you like about America to the country you pledge your allegiance to. We do not believe in dual citizenship either. One's citizenship should not be a split decision. We believe people should make a choice. So, the long and short of our position is that we welcome those who deeply want to be an American citizen, but believe in maintaining a more tourist/business-like relationship with those who consider themselves visitors and/or citizens of other countries. ​We believe it is hard to logically argue with this, and that most reasonable people agree with this position as well.